…and other previously owned cycles. 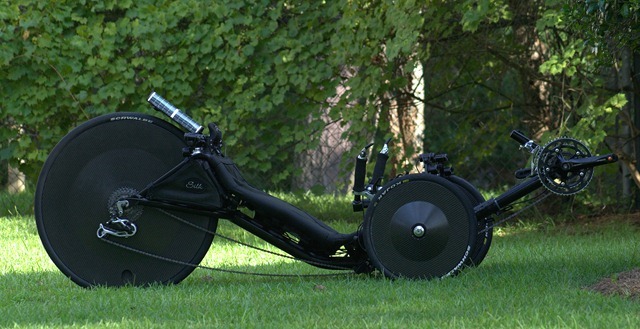 Posts in this blog take you from my decision to buy this incredibly special trike, a recumbent, December ’07, through her delivery [video]; customizing and riding her; as well as using various accessories. Her name is Silk [CT7225]. She’s an evolving specimen. Sold this wonderful trike 04/09/2012 [BROL Thread]. Jim, All I can say is SILK is the BOMB. What a beautiful machine!!!!!!!! My brother out in Los Angeles sent me a link to your site. I’ve very much enjoyed reading it and particularly found the Catrike 700 interesting. I’m on the other end of N.C. in Waynesville. I wanted to ask if you would consider adding my blog (Zeke’s Great Smokies 2 Wheeled Adventures) to your external links. Of course, I would hope and expect that you would read it and only list it if you find it of sufficient quality and interest for your own site. If you choose not to list it, no offense will be taken. I appreciate your consideration of my request. Class dude, pure class…. That’s one of the nicest looking trikes I have ever seen. Quoting for Boomer1, who left these questions elsewhere on this blog. Others many have similar questions and can find my responses by subject. Thanks!!! What I want to say now is about “Silk”…..does she have a sis.? I can see and appreciate why to you she is “a thing of beauty”! (I’ve seen the different pics and slideshow you put up.) I know it’s a Cat700, and some of the changes you’ve made…..however, you have upgraded and changed so many things she is so different from the original, and so much better in so many ways. And you have not told me yet if she has a sis.! The final tab could make it out of reach for me….but would like to know how much it would set me back (maybe I’ll win the lotto!) Also, would like to know the upgrades you have made, and if possible the reasons you chose them; and so that nobody may feel offended, or that you do not compromise yourself, it could be in a P.M., if it is all the same to you. She is so elegant, yet looks so nimble, however,….I’m sure she is built like “a brickhouse”! I’m hoping you have had the opportunity to read my initial reply to your questions on Silk [found here]. First, thank you so very much for your many compliments on my fun trike. Everything I’ve done to her is documented in this blog. You see lots of mods. I see the basic CT700 with some accessories that you may not find on lots of trikes. I have changed tires, those were a “normal wear-and-tear” replacement. I suffered a bent derailleur. I had to take what the LBS had–just happened to be an uptick. Everything else is stock. Again, accessories are different. As to cost, I have a general idea. I do not mind giving a ball park figure. It depend what you want. Certainly, one does not have to acquire all the “stuff” they want at the same time. I ask that you review my blog first and see what I’ve documented. There will be a link to a source for a particular item. There you will probably see the cost for that item. Silk rides tight and is easy to control. I have no fear doing fast downhills with her. I’ve seen speeds in the 40s. I’m hoping the two responses together begin to answer your questions. When you have more, If they are Silk in general, posting here is good. If they are on a particular accessory or component, then posting at the article is preferred. Thanx, Jim….for your several replies and your kind help. You’re quick and efficient! Now, in the “Old West”, you would have been a quick draw! I’ll be a good student, and will visit the different pages….and if I need some clarification, I know where to go! Thanx again! And continued success in all your endeavors. I’m sorry, I’m not finding more. I hope this helps. Thanks for the compliments on my trike–fun to setup and to ride. Where did you get the strobe light? I just bought a CT700 in part because of Silk, wanted to make sure you got the credit you deserve for building such a magnificent machine! May ask later for upgrade advice on my own Black Cat. Jim, Please forgive me for being so behind in my reading of your blog. I just saw a picture of Silk with her tailbox assembly. Oh. My. She is sooo beautiful. Please direct me to some more pictures of her! Have you created a video of she yet? She is everything I want Onyx to be. You must be very proud of her! James, when you are riding Silk, where do you think the most noticable pressure point is? An odd question I know. Since my roller skating incident a couple of years ago and the resulting injury, it is now something I need to think of. On Fayth you carved out a spot on the rear of the seat (am thinking you, also, noticed an ache at the tailbone). Do you have the same issue with Silk? Michele, that is a tough question. Riding a trike is so different. The buttocks are not much of an issue with Catrikes because of the mesh seats. Further, most trike rides are relatively brief and so fun-filled that one does not notice discomfort. On long rides–centuries, I’m thinking neck. otherwise, you are busy driving the machine and moving around that nothing gets warn out. I hope this makes sense and helps. Of course a different brand may have its peculiarities. Fascinating read from a cattrike owner in Australia. Very nice Jim,just saw the write up by Gizmag.com.If more people would get involved in biking,the hospitals might close their doors on the weekends.Everyone has the next secret diet,blah blah blah,eat normal and go biking with your family,grandkids,or just by yourself.Well,I will following you on your journeys,but again i must say,what a beautiful piece of rolling art you have created.Happy biking Jim. Really great looking bike. Where did the faring come from? I don’t want a faring but I want the light in the front and low like that. Yeo, I like this trike a LOT, although I eventually sold it. The tail faring was made by Goblin Motors. To my knowledge, they are no longer in business. There are multiple articles here on both the tail fairing and Goblin Motors. The front fairing was by Muller. They were bought by TerraCycle in Portland, Oregon. I would like to ask you what kind of carbon wheel cover did you used by your catrike 700 and could you give me an advice where I could get some?